I made some good progress on my first iteration of Butterick 5147 this week. 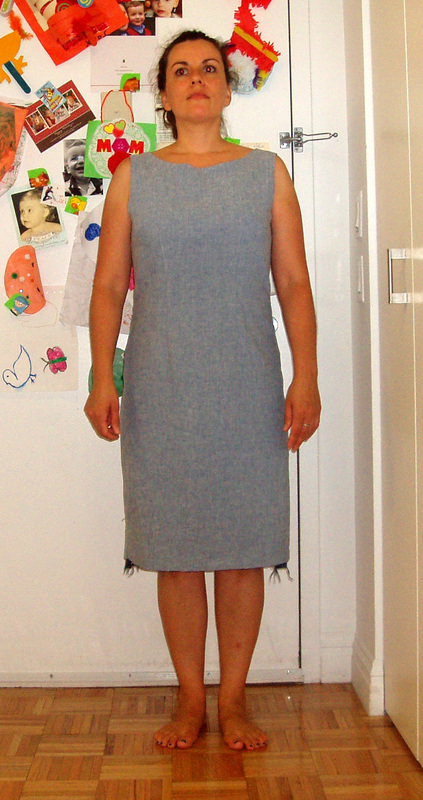 I cut into the stretch cotton chambray and started sewing it. Since I noticed that the neck was looking a little on the gapey side, I basted the side seams to check the fit of the dress. Intellectually, I know that different fabrics will behave differently with the same pattern, but the reality of it still annoys me a little bit. I would like one thing in life to be a little predictable please! I remembered to make the left hip side seam a little straighter on the curve having used tracing paper to copy both seam lines (the straighter for the left side and the curvier for the right side) on my muslin pattern piece. That side fit perfectly. Yeah! But, surprisingly, I needed to reduce the right side as well. Go figure. I guess this stretch woven needed a little negative ease for this pattern. Live and learn I guess. Trying it on, I was pleasantly surprised with how this dress looks. It looks just like a real dress! It always seems like a miracle when something I sew actually looks like it’s supposed to look. So funny. I just don’t trust my skills yet. And there’s something about the process where it’s hard to see the forest for the trees. You’re concentrating on this tiny detail like the bust dart and worry that it’s too pointy, and then you try it on and the whole is more than the parts. A minor miracle. I love it! I am pleased with the fit of the dress, aside from the neck gaping issues which cannot be helped at this stage of the game. I have minimal drag lines at the bust. And the dress is comfortable to wear and sit in; so the ease is spot on. It wears very differently than the muslin though, in a good way. This entry was posted in Butterick, Dresses, Fitting, Sew Alongs, Sewing. Bookmark the permalink. It looks great! I especially think it is flattering from the side, as it shows your curves but is not too tight. It looks slightly loose from the front and back, but that is probably because of the stretch woven. Despite what I’ve read elsewhere about using stretch wovens only for additional comfort (not impacting the size for fitting) I don’t really believe it. I think they decrease the size needed by up to one full size. The neckline doesn’t really look gappy to me (not noticeably so) – mine is worse in that regard. I wouldn’t have noticed it on yours. Dumb question – how can you tell it’s not cut on the straight of grain? It does look great! Congrats on your first fitted dress. I would stay-stitch the front neckline before you sew the facing in, so that it won’t stretch out anymore. When you stay stitch start at each shoulder and sew toward the middle front (single layer of fabric) just inside the seam line -say at the quarter inch seam allowance. And then press the front REALLY well with lots of steam, so that it comes back to the right shape. That should help the gap issue. I’m really narrow on top, so with a wider neckline like that, especially with a facing, I always pin a small dart or two out of the neckline tissue pattern before cutting out of my fabric – if I over fit, I can always trim the neckline down, but often necklines stretch out, and then it’s perfect. I agree with Robin that sometimes stretch wovens cause their own fitting issues. I’m about to make a TNT straight skirt out of a dark stretch denim….Luckily I have lots of darts to play with, but I think it might be a bit fussy. And there is always the “to tight in the morning, too loose in the afternoon” issue. Ah well…. Anyway, good luck with the neckline, stick a message in comments if it doesn’t make sense. Your dress is looking really, really nice! Ohmy! I’m thinking you are going to have a TNT sheath pattern very soooooon! 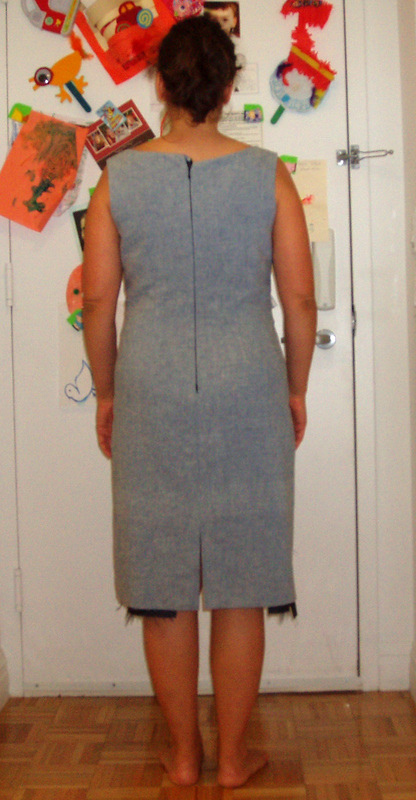 Except for the wobbly neckline – this is looking really good! That’s looking pretty good! I’ll be working on the same thing soon so yours is encouraging. BTW-Wish we could have met when I was in NYC last week. Maybe next time. I met up with Carolyn & Sheila @ Metro Textile (the fabric mecca) last Friday and I saw where you had been there earlier in the week. You look great! Jodi’s spot on with the post-fabrication steaming the neckline advise. I have to do that, too. And when it doesn’t work, I simply pinch out the neckline into mini-pleats (before the lining’s in, of course) and declare it a design change. No one outside of your blog-readin’ buddies will know. You’re doing excellent here! Next round will be closer to your idea of perfection, I’m sure. But from where I’m standing, you look fab. Looking great! I can relate to the grain issue. I sewed an otherwise fantastic sheath dress out of some beautiful black linen, lined it with silk and trimmed with some awesome braid that follows the lines of the princess seams. Everything went well… Perfect invisible zipper, perfect seam alignment, perfect lining, perfect fit. Imagine my annoyance when I tried on the final version and the dress skews to one side. Ugh. I don’t think most people would notice unless I point it out but it spoiled my otherwise “perfect” dress. Looking good so far! The fit looks really nice from the side view, and there are lots of great suggestions in the comments on fixing up the neckline. Nice work! Looking good! (no, make that great! Looking great!) I had the same issue with the gaping neckline on my dress and came to same conclusions others have already mentioned. I wound up running a long basting stitch around the neckline and I gathered it just a bit (not enough to pucker, though). I pressed with plenty of steam, stay-stitched and finished. Neckline was perfect after that. Congrats Elizabeth!! Yeah, ditto what everyone else said–looking good! I have trouble with gaping necklines on Annie too. For her white grad dress I ease-stitched and slightly gathered the neckline in the center front, then covered it all with that ruffle. Hey, whatever works! Not bad, it’s coming along nicely. I just finished sewing the two pieces I’ve been working on so I’ll be cutting out my pattern pieces tonight before going to bed. I think the dress is great! I finished my own “labor of love” dress about a week ago. So tempted to throw in the towel, BUT, I persevered 🙂 I know how ya feel about the grain thing….I SO don’t get it! Your dress is really looking good, although you have made me realise quite how slapdash (or maybe just lucky?!) I am about getting the fabric on grain! Oooh Elizabeth – this is looking very good – yes, it’s definitely a ‘real’ dress! This style really suits you and you have achieved a very flattering fit. I doubt if anyone else will notice such a tiny bit of gaping at the neckline. However, you might try running some stitches along it just inside the seamline, easing the stitching up, then sewing some seam tape over this to keep it stable – this has worked for me in the past. It’s coming along… Can’t wait to see the finished product…. Great job. The fit is looking wonderful. So flattering, professional, *and* a great fit. It is definitely a real dress! Now finish it up so you can wear it!! !